As does Mitt Romney. Even with the Chick Fil A "reframing" loss, the march for gay rights is gaining momentum. 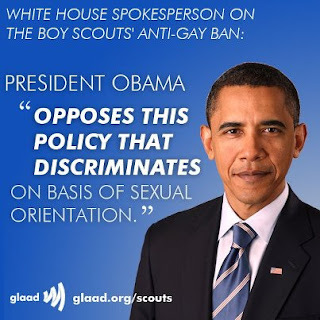 For the sitting President and his challenger to both vocally support opposition to this ban says volumes on the status of the "culture war"
President Barack Obama expressed his opposition to the Boy Scouts of America's reaffirmation of its policy of excluding gays on Wednesday. The president called the rule, which was renewed in July after a two-year review, "discrimination" in a statement to theWashington Blade. The ban has been faced with opposition by some former scouts, several of whom returned their badges in protest of the rule. 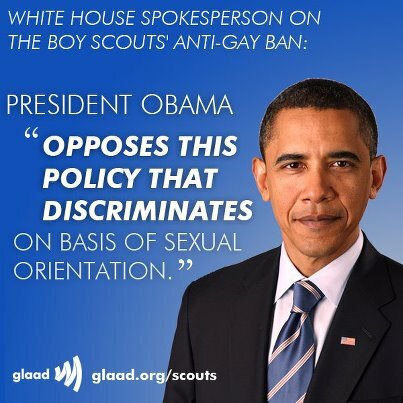 Republican presidential hopeful Mitt Romney also expressed opposition to the ban, saying "all people should be able to participate in the Boy Scouts regardless of their sexual orientation."